NEW YORK - As Deloris Gillespie went up the elevator to her fifth-floor Brooklyn apartment, carrying groceries, a man was waiting. His face was one her neighbors later recognized, and she surely must have, too. Surveillance video from inside the small elevator shows that he looked something like an exterminator, with a canister sprayer, white gloves and a dust mask, which was perched atop his head. The sprayer was full of flammable liquid. When the elevator opened Saturday afternoon, the man sprayed the 73-year-old woman "sort of methodically" over her head and parts of her body as her bags of groceries draped off her arms, New York Police Department spokesman Paul Browne said. She crouched down to try to protect herself, he said. Then, Browne said, the attacker pulled out a barbecue-style lighter and used it to ignite a rag in a bottle. He waited a few seconds as Gillespie huddled on the floor. Then he backed out of the elevator and tossed the flaming bottle in. Neighbors in the Prospect Heights building had no idea a woman was being burned alive when they quickly reported a fire. Overnight, a 47-year-old man smelling of gasoline went into a police station and implicated himself in Gillespie's death, Browne said. The suspect, Jerome Isaac, told police he set her on fire because she owed him $2,000 for some work he had done for her, Browne said. 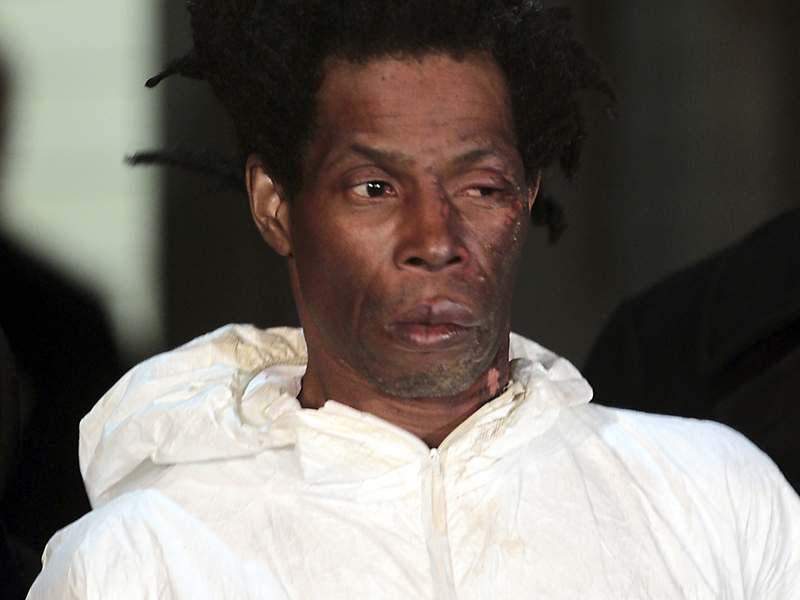 Isaac, of Brooklyn, was arrested Sunday on murder and arson charges. The Brooklyn district attorney's office had no information on whether he had an attorney. When Jaime Holguin, who lives on the same floor as Gillespie, saw surveillance pictures of the attacker he said, "Oh, my God!" Holguin, the manager of news development for The Associated Press, said the man in the surveillance pictures looked like a man who had lived with Gillespie for about six months last year and appeared to have been helping her out. He was certain Isaac was the man who worked for Gillespie after seeing post-arrest pictures of the suspect. Gillespie's arrangement with Isaac appeared to have ended by early 2011, but months later Holguin started seeing the man nearby on the street, looking "a lot more disheveled" and pushing a cart full of aluminum cans. Browne said that after setting Gillespie ablaze, Isaac set another fire at his own apartment building nearby, then hid on a roof before turning himself in to police. Residents were evacuated and kept away from the six-story building for hours Saturday night as police investigated. On Sunday, Holguin said, the fifth floor was a mess, with a melted elevator door and a layer of water on the floor. Holguin said he and his girlfriend had taken the elevator on their way out of the building shortly before the attack. They didn't see anyone on the floor with them but did notice an odd smell, as if someone was painting, he said. Holguin said police told them later that the assailant was already in the building and perhaps had hidden on another floor when they left their apartment. He remembered Gillespie as nice but sometimes a little off. "At least with me, some days she'd be very, very pleasant, and then the next time, she would almost ignore me," he said. Gillespie also went through a period this year where she would place duct tape over her apartment door whenever she left, Holguin said. As for the man who worked for Gillespie, Holguin said they had exchanged hellos and occasionally talked about Holguin's dog.